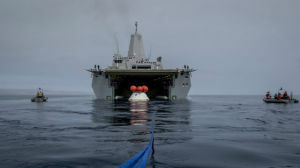 Two Navy ships based in San Diego were chosen to recover NASA’s Orion spacecraft after its first test flight a week from Thanksgiving. NASA gave the go-ahead for the launch of a Delta IV Heavy rocket with an unmanned Orion spacecraft on Dec. 4, and said the USS Anchorage and the USNS Salvor will recover the craft after it’s four-and-a-half-hour journey. The spacecraft is expected to splash down in the Pacific Ocean about 600 miles southwest of San Diego. After recovery, the Orion will be taken to Naval Base San Diego. 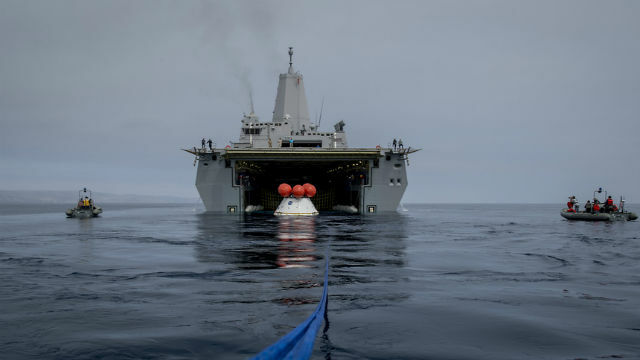 The Anchorage, an amphibious transport dock, and the Salvor, a salvage ship, successfully tested recovery of an Orion in September off the coast of San Diego. The Orion is being designed to carry a crew of four astronauts on long-duration missions to an asteroid, the Moon or Mars. The unmanned test next week will use the largest rocket currently available, but future manned flights will use NASA’s giant Space Launch System currently under development.